Listing 1 produces the product line manager reports in a few seconds. 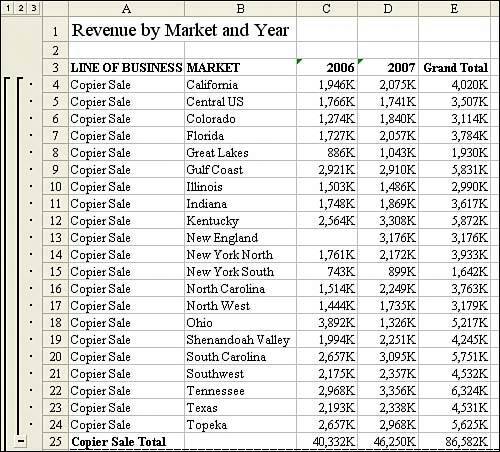 PT.PivotFields("Sum of Revenue").NumberFormat = "#,##0,K"
.Value = "Revenue by Market and Year"
Cells(GrandRow, 3).Resize(1, FinalCol - 2).NumberFormat = "#,##0,K"
10. It takes less than two seconds to convert 50,000 rows of transactional data to this useful report if you use the code that produced this example. Without pivot tables, the code would be far more complex. Figure 10 shows the report produced by this code.